Many Christians believe we are the generation who will see the End Times: the fullfillment of Revelation, the rapture of the believers and the 2nd coming of Jesus to set up his eartly kingdom. Many are now coming to believe that we will be here on earth for at least some of the trying times mentioned in Revelation, the last book in the Bible. If this is so, we will go through hard times, including economic and natural disasters and persecutions. Revelation tells us that it is going to be hard economic times for everyone, Christian and non-Christian alike. If Chrstians stockpile food and other necessities, are non-Christians going to allow us to hang on to these things? If chaos overtakes the world, will these things be forcefully taken away from those who do not defend themselves. And defend themselves at what cost? 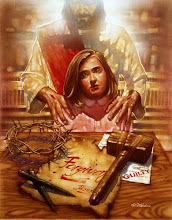 At some point, Revelation tells us that the "Beast" and the Anti-Christ will force everyone on the earth to take "the Mark of the Beast" if they want to buy or sell. Yet Christians are sternly warned several times that they must not take this mark, for if they do their doom will be sealed and they will no longer be among those who will be saved. The Anti-Christ knows this - this is his way of weeding out the Christian believers - so that he knows exactly who they are. Technology is such that it is not realistic to think that our feeble efforts will save ourselves. Have faith. 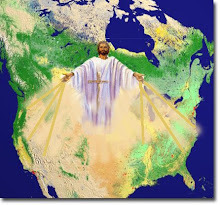 The Lord is able to provide if it is his plan for you to remain on the eatrh to do his will until the rapture. And if it is his will for you to die before the rapture, trust that you will be better off with Christ in heaven until he comes to claim the earth for himself. I have compiled scriptures that show the Lord can provide - If that is his will. Let him show you his power and love in that provision, and if it is his will for you to die remember the saints that have gone on before you and take strength - God has the power to grant you the peace and faith to go through this as well. 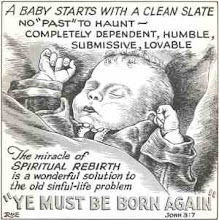 8 The child grew and was weaned, and on the day Isaac was weaned Abraham held a great feast. 9 But Sarah saw that the son [Ishmael] whom Hagar the Egyptian had borne to Abraham was mocking, 10 and she said to Abraham, "Get rid of that slave woman and her son, for that slave woman's son will never share in the inheritance with my son Isaac." 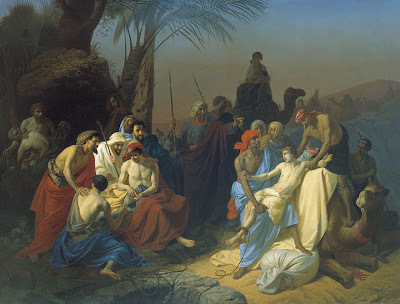 3 Now Israel loved Joseph more than any of his other sons, because he had been born to him in his old age; and he made a richly ornamented robe for him. 4 When his brothers saw that their father loved him more than any of them, they hated him and could not speak a kind word to him. . . . 17 . . . Joseph went after his brothers and found them near Dothan. 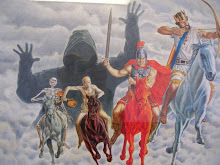 18 But they saw him in the distance, and before he reached them, they plotted to kill him. 34 Then Jacob tore his clothes, put on sackcloth and mourned for his son many days. 35 All his sons and daughters came to comfort him, but he refused to be comforted. "No," he said, "in mourning will I go down to the grave to my son." So his father wept for him. . . . .
Genesis 41 Pharaoh's Dreams 1 . . . Pharaoh had a dream: He was standing by the Nile, 2 when out of the river there came up seven cows, sleek and fat, and they grazed among the reeds. 3 After them, seven other cows, ugly and gaunt, came up out of the Nile and stood beside those on the riverbank. 4 And the cows that were ugly and gaunt ate up the seven sleek, fat cows. Then Pharaoh woke up. 9 Then the chief cupbearer said to Pharaoh, "Today I am reminded of my shortcomings. 10 Pharaoh was once angry with his servants, and he imprisoned me and the chief baker in the house of the captain of the guard. 11 Each of us had a dream the same night, and each dream had a meaning of its own. 12 Now a young Hebrew was there with us, a servant of the captain of the guard. We told him our dreams, and he interpreted them for us, giving each man the interpretation of his dream. 13 And things turned out exactly as he interpreted them to us: I was restored to my position, and the other man was hanged. " 16 "I cannot do it," Joseph replied to Pharaoh, "but God will give Pharaoh the answer he desires." . . . 25 Then Joseph said to Pharaoh, "The dreams of Pharaoh are one and the same. God has revealed to Pharaoh what he is about to do. 26 The seven good cows are seven years, and the seven good heads of grain are seven years; it is one and the same dream. 27 The seven lean, ugly cows that came up afterward are seven years, and so are the seven worthless heads of grain scorched by the east wind: They are seven years of famine. 28 "It is just as I said to Pharaoh: God has shown Pharaoh what he is about to do. 29 Seven years of great abundance are coming throughout the land of Egypt, 30 but seven years of famine will follow them. 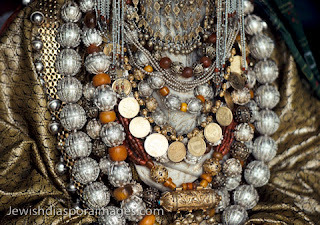 Then all the abundance in Egypt will be forgotten, and the famine will ravage the land. 31 The abundance in the land will not be remembered, because the famine that follows it will be so severe. 32 The reason the dream was given to Pharaoh in two forms is that the matter has been firmly decided by God, and God will do it soon. . . . . . 33 "And now let Pharaoh look for a discerning and wise man and put him in charge of the land of Egypt. 34 Let Pharaoh appoint commissioners over the land to take a fifth of the harvest of Egypt during the seven years of abundance. 35 They should collect all the food of these good years that are coming and store up the grain under the authority of Pharaoh, to be kept in the cities for food. 36 This food should be held in reserve for the country, to be used during the seven years of famine that will come upon Egypt, so that the country may not be ruined by the famine." 37 The plan seemed good to Pharaoh and to all his officials. 38 So Pharaoh asked them, "Can we find anyone like this man, one in whom is the spirit of God ?" 39 Then Pharaoh said to Joseph, "Since God has made all this known to you, there is no one so discerning and wise as you. 40 You shall be in charge of my palace, and all my people are to submit to your orders. Only with respect to the throne will I be greater than you." 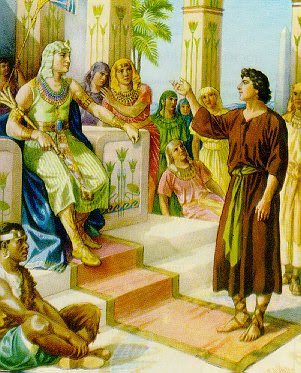 . . . . 46 Joseph was thirty years old when he entered the service of Pharaoh king of Egypt. And Joseph went out from Pharaoh's presence and traveled throughout Egypt. 47 During the seven years of abundance the land produced plentifully. 48 Joseph collected all the food produced in those seven years of abundance in Egypt and stored it in the cities. In each city he put the food grown in the fields surrounding it. 49 Joseph stored up huge quantities of grain, like the sand of the sea; it was so much that he stopped keeping records because it was beyond measure. . . . 53 The seven years of abundance in Egypt came to an end, 54 and the seven years of famine began, just as Joseph had said. There was famine in all the other lands, but in the whole land of Egypt there was food. 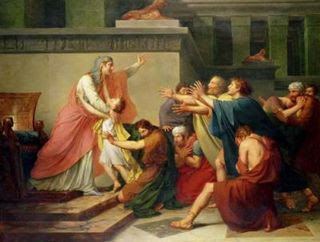 55 When all Egypt began to feel the famine, the people cried to Pharaoh for food. Then Pharaoh told all the Egyptians, "Go to Joseph and do what he tells you." 56 When the famine had spread over the whole country, Joseph opened the storehouses and sold grain to the Egyptians, for the famine was severe throughout Egypt. 57 And all the countries came to Egypt to buy grain from Joseph, because the famine was severe in all the world. . . . Genesis 42 Joseph's Brothers Go to Egypt 1 When Jacob [Israel] learned that there was grain in Egypt, he said to his sons, "Why do you just keep looking at each other?" 2 He continued, "I have heard that there is grain in Egypt. Go down there and buy some for us, so that we may live and not die." 3 Then ten of Joseph's brothers went down to buy grain from Egypt. 4 But Jacob did not send Benjamin, Joseph's brother, with the others, because he was afraid that harm might come to him. 5 So Israel's sons were among those who went to buy grain, for the famine was in the land of Canaan also. 6 Now Joseph was the governor of the land, the one who sold grain to all its people. So when Joseph's brothers arrived, they bowed down to him with their faces to the ground. 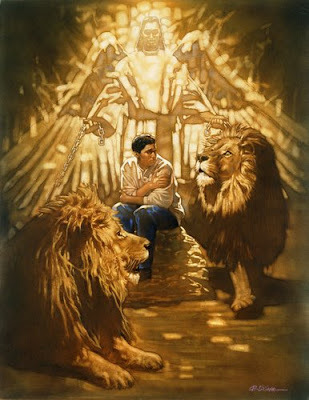 7 As soon as Joseph saw his brothers, he recognized them, but he pretended to be a stranger and spoke harshly to them. "Where do you come from?" he asked. "From the land of Canaan," they replied, "to buy food." Joseph Makes Himself Known 1 Then Joseph could no longer control himself before all his attendants, and he cried out, "Have everyone leave my presence!" So there was no one with Joseph when he made himself known to his brothers. 2 And he wept so loudly that the Egyptians heard him, and Pharaoh's household heard about it. 21 So the sons of Israel did this. Joseph gave them carts, as Pharaoh had commanded, and he also gave them provisions for their journey. 22 To each of them he gave new clothing, but to Benjamin he gave three hundred shekels of silver and five sets of clothes. 23 And this is what he sent to his father: ten donkeys loaded with the best things of Egypt, and ten female donkeys loaded with grain and bread and other provisions for his journey. 24 Then he sent his brothers away, and as they were leaving he said to them, "Don't quarrel on the way! " 22 Then Moses led Israel from the Red Sea and they went into the Desert of Shur. 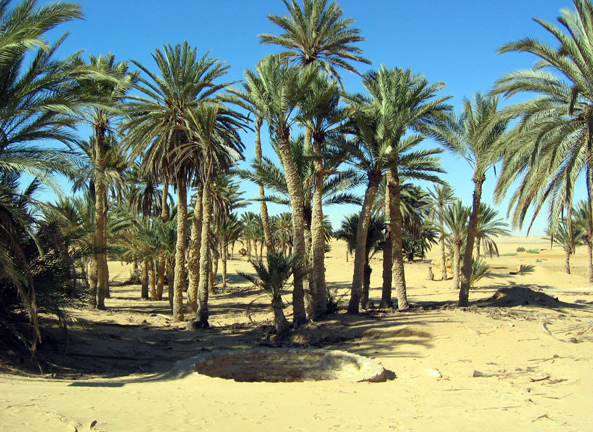 For three days they traveled in the desert without finding water. 23 When they came to Marah, they could not drink its water because it was bitter. (That is why the place is called Marah. [bitter] ) 24 So the people grumbled against Moses, saying, "What are we to drink?" 25 Then Moses cried out to the LORD, and the LORD showed him a piece of wood. He threw it into the water, and the water became sweet. There the LORD made a decree and a law for them, and there he tested them. 26 He said, "If you listen carefully to the voice of the LORD your God and do what is right in his eyes, if you pay attention to his commands and keep all his decrees, I will not bring on you any of the diseases I brought on the Egyptians, for I am the LORD, who heals you." 1 The whole Israelite community set out from Elim and came to the Desert of Sin, which is between Elim and Sinai, on the fifteenth day of the second month after they had come out of Egypt. 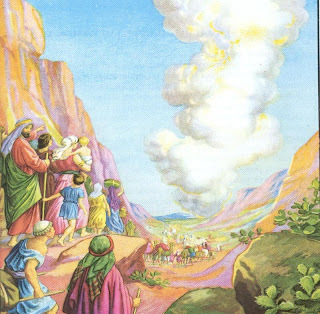 2 In the desert the whole community grumbled against Moses and Aaron. 3 The Israelites said to them, "If only we had died by the LORD's hand in Egypt! There we sat around pots of meat and ate all the food we wanted, but you have brought us out into this desert to starve this entire assembly to death." 6 So Moses and Aaron said to all the Israelites, "In the evening you will know that it was the LORD who brought you out of Egypt, 7 and in the morning you will see the glory of the LORD, because he has heard your grumbling against him. Who are we, that you should grumble against us?" 8 Moses also said, "You will know that it was the LORD when he gives you meat to eat in the evening and all the bread you want in the morning, because he has heard your grumbling against him. Who are we? You are not grumbling against us, but against the LORD." 9 Then Moses told Aaron, "Say to the entire Israelite community, 'Come before the LORD, for he has heard your grumbling.' "
11 The LORD said to Moses, 12 "I have heard the grumbling of the Israelites. Tell them, 'At twilight you will eat meat, and in the morning you will be filled with bread. Then you will know that I am the LORD your God.' "
13 That evening quail came and covered the camp, and in the morning there was a layer of dew around the camp. 14 When the dew was gone, thin flakes like frost on the ground appeared on the desert floor. 15 When the Israelites saw it, they said to each other, "What is it?" For they did not know what it was. Moses said to them, "It is the bread the LORD has given you to eat. 16 This is what the LORD has commanded: 'Each one is to gather as much as he needs. Take an omer for each person you have in your tent.' "
21 Each morning everyone gathered as much as he needed, and when the sun grew hot, it melted away. 22 On the sixth day, they gathered twice as much—two omers for each person—and the leaders of the community came and reported this to Moses. 23 He said to them, "This is what the LORD commanded: 'Tomorrow is to be a day of rest, a holy Sabbath to the LORD. So bake what you want to bake and boil what you want to boil. Save whatever is left and keep it until morning.' "
27 Nevertheless, some of the people went out on the seventh day to gather it, but they found none. 28 Then the LORD said to Moses, "How long will you refuse to keep my commands and my instructions? 29 Bear in mind that the LORD has given you the Sabbath; that is why on the sixth day he gives you bread for two days. Everyone is to stay where he is on the seventh day; no one is to go out." 30 So the people rested on the seventh day. 31 The people of Israel called the bread manna. It was white like coriander seed and tasted like wafers made with honey. 32 Moses said, "This is what the LORD has commanded: 'Take an omer of manna and keep it for the generations to come, so they can see the bread I gave you to eat in the desert when I brought you out of Egypt.' "
1 The whole Israelite community set out from the Desert of Sin, traveling from place to place as the LORD commanded. They camped at Rephidim, but there was no water for the people to drink. 2 So they quarreled with Moses and said, "Give us water to drink." Moses replied, "Why do you quarrel with me? Why do you put the LORD to the test?" 5 The LORD answered Moses, "Walk on ahead of the people. Take with you some of the elders of Israel and take in your hand the staff with which you struck the Nile, and go. 6 I will stand there before you by the rock at Horeb. Strike the rock, and water will come out of it for the people to drink." So Moses did this in the sight of the elders of Israel. 7 And he called the place Massah [Massah means testing] and Meribah [Meribah means quarreling] because the Israelites quarreled and because they tested the LORD saying, "Is the LORD among us or not?" 1 Be careful to follow every command I am giving you today, so that you may live and increase and may enter and possess the land that the LORD promised on oath to your forefathers. 2 Remember how the LORD your God led you all the way in the desert these forty years, to humble you and to test you in order to know what was in your heart, whether or not you would keep his commands. 3 He humbled you, causing you to hunger and then feeding you with manna, which neither you nor your fathers had known, to teach you that man does not live on bread alone but on every word that comes from the mouth of the LORD. 4 Your clothes did not wear out and your feet did not swell during these forty years. 5 Know then in your heart that as a man disciplines his son, so the LORD your God disciplines you. 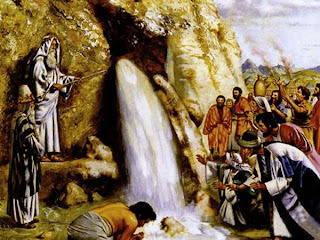 2 Moses summoned all the Israelites and said to them: Your eyes have seen all that the LORD did in Egypt to Pharaoh, to all his officials and to all his land. 3 With your own eyes you saw those great trials, those miraculous signs and great wonders. 4 But to this day the LORD has not given you a mind that understands or eyes that see or ears that hear. 5 During the forty years that I led you through the desert, your clothes did not wear out, nor did the sandals on your feet. 6 You ate no bread and drank no wine or other fermented drink. I did this so that you might know that I am the LORD your God. 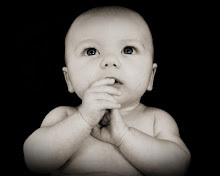 5 . . . "Stand up and praise the LORD your God, who is from everlasting to everlasting. " 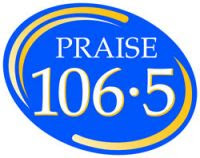 "Blessed be your glorious name, and may it be exalted above all blessing and praise. 6 You alone are the LORD. You made the heavens, even the highest heavens, and all their starry host, the earth and all that is on it, the seas and all that is in them. You give life to everything, and the multitudes of heaven worship you. 7 "You are the LORD God, who chose Abram and brought him out of Ur of the Chaldeans and named him Abraham. 8 You found his heart faithful to you, and you made a covenant with him to give to his descendants the land of the Canaanites, Hittites, Amorites, Perizzites, Jebusites and Girgashites. You have kept your promise because you are righteous. 9 "You saw the suffering of our forefathers in Egypt; you heard their cry at the Red Sea. 10 You sent miraculous signs and wonders against Pharaoh, against all his officials and all the people of his land, for you knew how arrogantly the Egyptians treated them. You made a name for yourself, which remains to this day. 11 You divided the sea before them, so that they passed through it on dry ground, but you hurled their pursuers into the depths, like a stone into mighty waters. 12 By day you led them with a pillar of cloud, and by night with a pillar of fire to give them light on the way they were to take. 13 "You came down on Mount Sinai; you spoke to them from heaven. You gave them regulations and laws that are just and right, and decrees and commands that are good. 14 You made known to them your holy Sabbath and gave them commands, decrees and laws through your servant Moses. 15 In their hunger you gave them bread from heaven and in their thirst you brought them water from the rock; you told them to go in and take possession of the land you had sworn with uplifted hand to give them. 16 "But they, our forefathers, became arrogant and stiff-necked, and did not obey your commands. 17 They refused to listen and failed to remember the miracles you performed among them. They became stiff-necked and in their rebellion appointed a leader in order to return to their slavery. But you are a forgiving God, gracious and compassionate, slow to anger and abounding in love. Therefore you did not desert them, 18 even when they cast for themselves an image of a calf and said, 'This is your god, who brought you up out of Egypt,' or when they committed awful blasphemies. 19 "Because of your great compassion you did not abandon them in the desert. By day the pillar of cloud did not cease to guide them on their path, nor the pillar of fire by night to shine on the way they were to take. 20 You gave your good Spirit to instruct them. You did not withhold your manna from their mouths, and you gave them water for their thirst. 21 For forty years you sustained them in the desert; they lacked nothing, their clothes did not wear out nor did their feet become swollen. 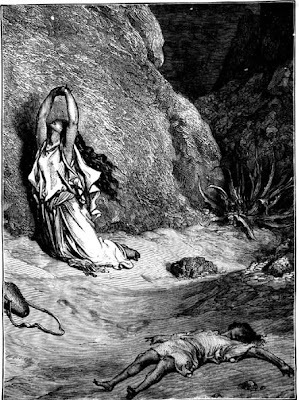 The Widow at Zarephath 7 Some time later the brook dried up because there had been no rain in the land. 8 Then the word of the LORD came to him: 9 "Go at once to Zarephath of Sidon and stay there. I have commanded a widow in that place to supply you with food." 10 So he went to Zarephath. When he came to the town gate, a widow was there gathering sticks. 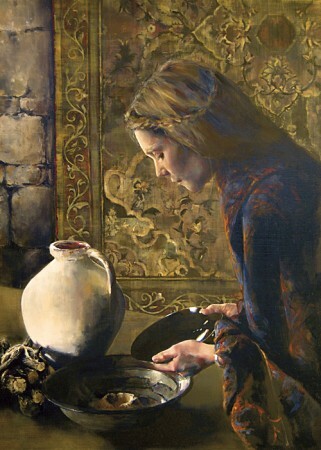 He called to her and asked, "Would you bring me a little water in a jar so I may have a drink?" 11 As she was going to get it, he called, "And bring me, please, a piece of bread." 1 King Nebuchadnezzar made an image of gold, ninety feet high and nine feet wide, and set it up on the plain of Dura in the province of Babylon. 2 He then summoned the satraps, prefects, governors, advisers, treasurers, judges, magistrates and all the other provincial officials to come to the dedication of the image he had set up. 3 So the satraps, prefects, governors, advisers, treasurers, judges, magistrates and all the other provincial officials assembled for the dedication of the image that King Nebuchadnezzar had set up, and they stood before it. 4 Then the herald loudly proclaimed, "This is what you are commanded to do, O peoples, nations and men of every language: 5 As soon as you hear the sound of the horn, flute, zither, lyre, harp, pipes and all kinds of music, you must fall down and worship the image of gold that King Nebuchadnezzar has set up. 6 Whoever does not fall down and worship will immediately be thrown into a blazing furnace." 8 At this time some astrologers came forward and denounced the Jews. 9 They said to King Nebuchadnezzar, "O king, live forever! 10 You have issued a decree, O king, that everyone who hears the sound of the horn, flute, zither, lyre, harp, pipes and all kinds of music must fall down and worship the image of gold, 11 and that whoever does not fall down and worship will be thrown into a blazing furnace. 12 But there are some Jews whom you have set over the affairs of the province of Babylon—Shadrach, Meshach and Abednego—who pay no attention to you, O king. 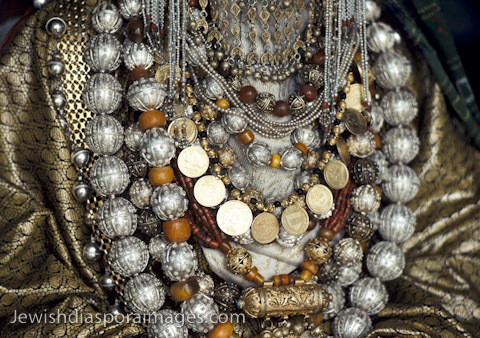 They neither serve your gods nor worship the image of gold you have set up." 25 He said, "Look! 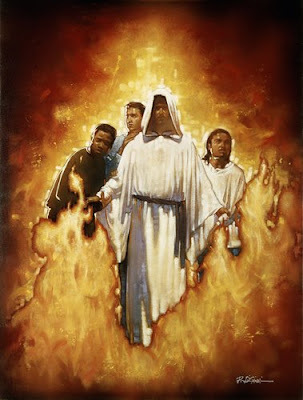 I see four men walking around in the fire, unbound and unharmed, and the fourth looks like a son of the gods [Most belive that this was Jesus - remember, Jesus always existed with God in heaven] ." 28 Then Nebuchadnezzar said, "Praise be to the God of Shadrach, Meshach and Abednego, who has sent his angel and rescued his servants! They trusted in him and defied the king's command and were willing to give up their lives rather than serve or worship any god except their own God. 29 Therefore I decree that the people of any nation or language who say anything against the God of Shadrach, Meshach and Abednego be cut into pieces and their houses be turned into piles of rubble, for no other god can save in this way." 25 Then King Darius wrote to all the peoples, nations and men of every language throughout the land: "May you prosper greatly! 26 "I issue a decree that in every part of my kingdom people must fear and reverence the God of Daniel. "For he is the living God and he endures forever; his kingdom will not be destroyed, his dominion will never end. 27 He rescues and he saves; he performs signs and wonders in the heavens and on the earth. 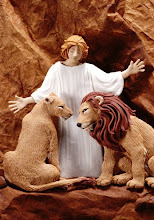 He has rescued Daniel from the power of the lions." Then Jesus went around teaching from village to village. 7 Calling the Twelve to him, he sent them out two by two and gave them authority over evil spirits. 8 These were his instructions: "Take nothing for the journey except a staff—no bread, no bag, no money in your belts. 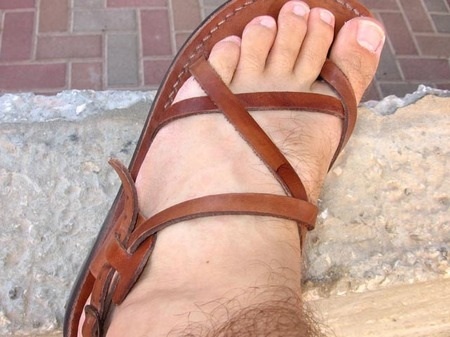 9 Wear sandals but not an extra tunic. 10 Whenever you enter a house, stay there until you leave that town. 11 And if any place will not welcome you or listen to you, shake the dust off your feet when you leave, as a testimony against them." 12 They went out and preached that people should repent. 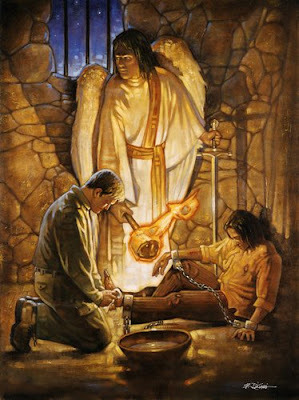 13 They drove out many demons and anointed many sick people with oil and healed them. . . .
37 But he answered, "You give them something to eat." They said to him, "That would take eight months of a man's wages ! Are we to go and spend that much on bread and give it to them to eat?" 1 When Jesus had called the Twelve together, he gave them power and authority to drive out all demons and to cure diseases, 2 and he sent them out to preach the kingdom of God and to heal the sick. 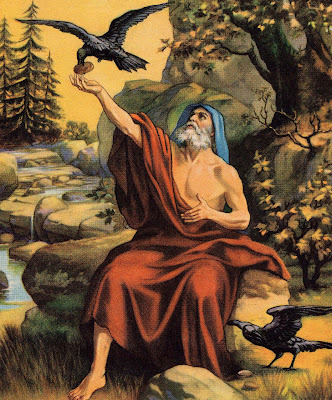 3 He told them: "Take nothing for the journey—no staff, no bag, no bread, no money, no extra tunic. 4 Whatever house you enter, stay there until you leave that town. 5 If people do not welcome you, shake the dust off your feet when you leave their town, as a testimony against them." 6 So they set out and went from village to village, preaching the gospel and healing people everywhere. Jesus Feeds the Five Thousand 10 When the apostles returned, they reported to Jesus what they had done. Then he took them with him and they withdrew by themselves to a town called Bethsaida, 11 but the crowds learned about it and followed him. He welcomed them and spoke to them about the kingdom of God, and healed those who needed healing. But he said to his disciples, "Have them sit down in groups of about fifty each." 15 The disciples did so, and everybody sat down. 16 Taking the five loaves and the two fish and looking up to heaven, he gave thanks and broke them. Then he gave them to the disciples to set before the people. 17 They all ate and were satisfied, and the disciples picked up twelve basketfuls of broken pieces that were left over. 1 Some time after this, Jesus crossed to the far shore of the Sea of Galilee (that is, the Sea of Tiberias), 2 and a great crowd of people followed him because they saw the miraculous signs he had performed on the sick. 3 Then Jesus went up on a mountainside and sat down with his disciples. 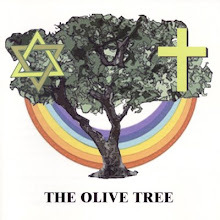 4 The Jewish Passover Feast was near. 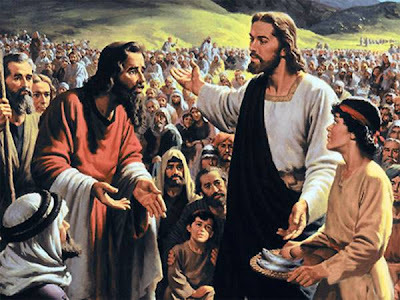 5 When Jesus looked up and saw a great crowd coming toward him, he said to Philip, "Where shall we buy bread for these people to eat?" 6 He asked this only to test him, for he already had in mind what he was going to do. 7 Philip answered him, "Eight months' wages would not buy enough bread for each one to have a bite!" 8 Another of his disciples, Andrew, Simon Peter's brother, spoke up, 9 "Here is a boy with five small barley loaves and two small fish, but how far will they go among so many?" 10 Jesus said, "Have the people sit down." There was plenty of grass in that place, and the men sat down, about five thousand of them. 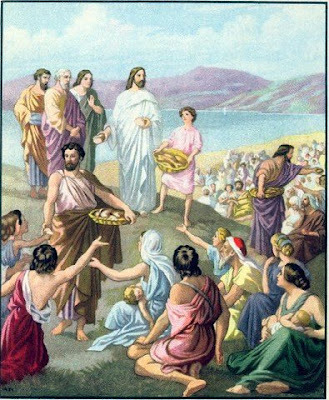 11 Jesus then took the loaves, gave thanks, and distributed to those who were seated as much as they wanted. He did the same with the fish. 12 When they had all had enough to eat, he said to his disciples, "Gather the pieces that are left over. Let nothing be wasted." 13 So they gathered them and filled twelve baskets with the pieces of the five barley loaves left over by those who had eaten. 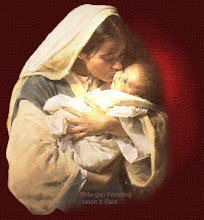 14 After the people saw the miraculous sign that Jesus did, they began to say, "Surely this is the Prophet who is to come into the world." 15 Jesus, knowing that they intended to come and make him king by force, withdrew again to a mountain by himself. 34 "How many loaves do you have?" Jesus asked. "Seven," they replied, "and a few small fish." 35 He told the crowd to sit down on the ground. 36 Then he took the seven loaves and the fish, and when he had given thanks, he broke them and gave them to the disciples, and they in turn to the people. 37 They all ate and were satisfied. Afterward the disciples picked up seven basketfuls of broken pieces that were left over. 38 The number of those who ate was four thousand, besides women and children. 39 After Jesus had sent the crowd away, he got into the boat and went to the vicinity of Magadan. 5 When they went across the lake, the disciples forgot to take bread. 6 "Be careful," Jesus said to them. "Be on your guard against the yeast of the Pharisees and Sadducees." 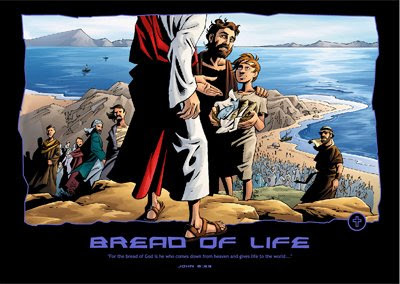 8 Aware of their discussion, Jesus asked, "You of little faith, why are you talking among yourselves about having no bread? 9 Do you still not understand? Don't you remember the five loaves for the five thousand, and how many basketfuls you gathered? 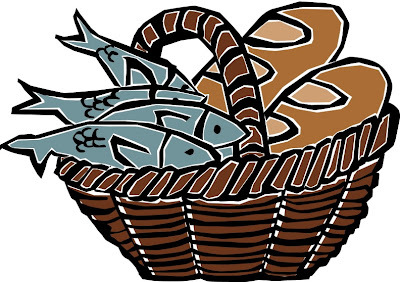 10 Or the seven loaves for the four thousand, and how many basketfuls you gathered? 11 How is it you don't understand that I was not talking to you about bread? But be on your guard against the yeast of the Pharisees and Sadducees." 12 Then they understood that he was not telling them to guard against the yeast used in bread, but against the teaching of the Pharisees and Sadducees. 1 During those days another large crowd gathered. Since they had nothing to eat, Jesus called his disciples to him and said, 2 "I have compassion for these people; they have already been with me three days and have nothing to eat. 3 If I send them home hungry, they will collapse on the way, because some of them have come a long distance." 6 He told the crowd to sit down on the ground. 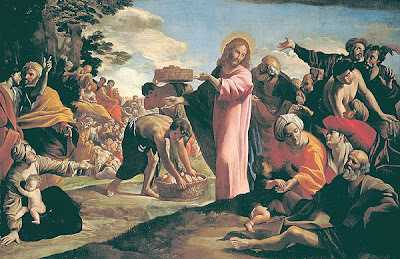 When he had taken the seven loaves and given thanks, he broke them and gave them to his disciples to set before the people, and they did so. 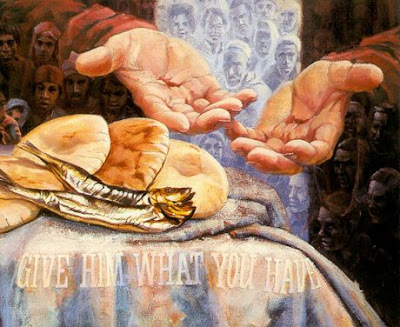 7 They had a few small fish as well; he gave thanks for them also and told the disciples to distribute them. 8 The people ate and were satisfied. Afterward the disciples picked up seven basketfuls of broken pieces that were left over. 9 About four thousand men were present. And having sent them away, 10 he got into the boat with his disciples and went to the region of Dalmanutha. 11 The Pharisees came and began to question Jesus. To test him, they asked him for a sign from heaven. 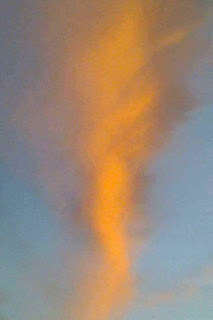 12 He sighed deeply and said, "Why does this generation ask for a miraculous sign? I tell you the truth, no sign will be given to it." 13 Then he left them, got back into the boat and crossed to the other side. The Yeast of the Pharisees and Herod 14 The disciples had forgotten to bring bread, except for one loaf they had with them in the boat. 15 "Be careful," Jesus warned them. "Watch out for the yeast of the Pharisees and that of Herod." 17 Aware of their discussion, Jesus asked them: "Why are you talking about having no bread? Do you still not see or understand? Are your hearts hardened? 18 Do you have eyes but fail to see, and ears but fail to hear? And don't you remember? 19 When I broke the five loaves for the five thousand, how many basketfuls of pieces did you pick up?" "Twelve," they replied.